The word "telescope" was first used by Prince Federico Cesi of Rome. Frenchman Etienne Oehmichen set the first helicopter distance record recognized by the FAI with a flight of 358 meters. The record stood four days. K. Reinmuth discovered asteroid #1095 Tulipa. K. Reinmuth discovered asteroid #2856. RCA demonstrated its new electron microscope in Philadelphia, Pennsylvania. L. Oterma discovered asteroid #2501 Lohja. Ampex Corporation demonstrated the first commercial videotape recorder. USSR's Sputnik 2 burned up during reentry, carrying Laika, the first dog in space, who died shortly after launch. Sputnik 2 weighed about 1120 pounds (508 kg) at launch. After orbiting the Earth 2,570 times, Sputnik 2, which turned out to be the first space crypt, fell back to Earth after 162 days on 14 April 1958, burning up during re-entry. The US Air Force's Discoverer 2 became the first spacecraft to return a re-entry capsule from Earth orbit. However, the return capsule was released early, landing in the Arctic instead of Hawaii, and was not recovered. Discoverer 2, launched 13 April 1959 by the US Air Force, was a cylindrical satellite designed to gather spacecraft engineering data and to attempt ejection of an instrument package from orbit for recovery on Earth. The spacecraft was launched into a 239 km x 346 km polar orbit by a Thor-Agena A booster. The spacecraft was three-axis stabilized and was commanded from Earth. After 17 orbits, on 14 April 1959, a reentry vehicle was ejected. The reentry vehicle separated into two sections, one consisting of the protection equipment, retrorocket and main structure and the other the reentry capsule. It was planned that the capsule would reenter over the vicinity of Hawaii for recovery, but a timer malfunction caused premature capsule ejection and reentry over the north polar region. The capsule was never recovered. The main instrumentation payload remained in orbit and carried out vehicular performance and communications tests. The Discoverer 2 mission successfully gathered data on propulsion, communications, orbital performance, and stabilization. All equipment functioned as programmed except the timing device. Electrical power for all instruments was provided by NiCd batteries. Telemetry functioned until 14 April 1959, and the main tracking beacon functioned until 21 April 1959. Discoverer 2 was the first satellite to be stabilized in orbit in all three axes, to be maneuvered on command from the Earth, to separate a reentry vehicle on command, and to send its reentry vehicle back to Earth. USSR launched Cosmos 212, which successfully docked automatically with Cosmos 213 after the latter satellite was launched a day later. Cosmos 212, launched 14 April 1968, was one of a series of Soviet Earth satellites whose purpose was to study outer space, the upper layers of the atmosphere, and the Earth. Scientific data and measurements were relayed to Earth by multichannel telemetry systems equipped with space-borne memory units. Cosmos 212 and Cosmos 213 automatically docked in orbit on 15 April 1968. Both satellites later landed on Soviet territory. NASA's Apollo 13 S-IVB booster stage impacted the Moon, as planned, at 2.75 S, 27.86 W with a velocity of 2.58 km/s at a 76 degrees angle from horizontal. Apollo 13 (AS 508) consisted of the Command and Service Module (CSM) "Odyssey" and the Lunar Module (LM) "Aquarius." The flight was launched on 11 April 1970, intended to be the third mission to carry humans to the surface of the Moon, but an explosion of one of the oxygen tanks and resulting damage to other systems resulted in the mission being aborted before the planned Lunar landing could take place. The crew, commander James A. Lovell, Jr., Command Module pilot John L. Swigert, Jr., and Lunar Module pilot Fred W. Haise Jr., were returned safely to Earth on 17 April 1970. The purposes of the Apollo 13 mission were (1) to explore the hilly upland Fra Mauro region of the Moon, (2) to perform selenological inspection, survey, and sampling of material in the Fra Mauro formation, (3) to deploy and activate an Apollo Lunar Surface Experiments Package (ALSEP), (4) to further develop man's capability to work in the Lunar environment, and (5) to obtain photographs of candidate Lunar exploration sites. These goals were to be carried out from a near-circular Lunar orbit and on the Lunar surface at 3 deg S latitude, 17 deg W longitude. Although the planned mission objectives were not realized, a limited amount of photographic data was obtained. Lovell was a Navy captain on his fourth spaceflight (he'd flown previously on Gemini 7, Gemini 12, and Apollo 8), Haise and Swigert were both civilians on their first spaceflights. Apollo 13 was launched at 19:13:00 UT (02:13:00 p.m. EST) from pad 39A at the Kennedy Space Center, Florida. During the second stage boost, the center engine of the S-II stage cut off 132 seconds early, causing the remaining four engines to burn 34 seconds longer than normal. The velocity after the S-II burn was still lower than planned by 68 m/sec, so the S-IVB orbital insertion burn at 19:25:40 was 9 seconds longer than planned. Translunar injection took place at 21:54:47 UT, CSM/S-IVB separation at 22:19:39 UT, and CSM-LM docking at 22:32:09 UT. After separation from the Apollo spacecraft, the S-IVB auxilliary propulsive system burned at 01:13 UT on 12 April for 217 seconds to put the S-IVB into a Lunar impact trajectory. (It impacted the Lunar surface on 14 April 1970.) The Apollo astronauts made a 3.4 second mid-course correction burn at 01:27 UT on 13 April. A television broadcast was made from Apollo 13 from 02:24 UT to 02:59 UT on 14 April and a few minutes later, at 03:06:18 UT, Jack Swigert turned the fans on to stir oxygen tanks 1 and 2 in the Service Module. Wires which had been damaged during pre-flight testing in the Beech-built oxygen tank number 2 shorted, and the Teflon insulation caught fire. The fire spread within the tank, raising the pressure until at 3:07:53 UT on 14 April (10:07:53 EST 13 April; 55:54:53 mission elapsed time), oxygen tank number 2 exploded, damaging oxygen tank number 1 and the interior of the Service Module, and blowing off the bay number 4 cover. With the oxygen stores depleted, the Command Module was unusable, the mission had to be aborted, and the crew transferred to the Lunar Module and powered down the Command Module. At 08:43 UT, a mid-course maneuver (11.6 m/s delta V) was performed using the Lunar Module descent propulsion system (LMDPS) to place the spacecraft on a free-return trajectory which would take it around the Moon on a path that took the astronauts farther from Earth than any humans had ever been before and return it to Earth, targeted at the Indian Ocean at 03:13 UT 18 April. After rounding the Moon, another LMDPS burn at 02:40:39 UT 15 April for 263.4 seconds produced a differential velocity of 262 m/s, and shortened the estimated return time to 18:06 UT 17 April, with splashdown in the mid-Pacific. To conserve power and other consumables, the Lunar Module was powered down except for environmental control, communications, and telemetry, and passive thermal control was established. At 04:32 UT on 16 April, a 15 second LMDPS burn at 10% throttle produced a 2.3 m/s velocity decrease and raised the entry flight path angle to -6.52 degrees. Following this, the crew partially powered up the CSM. On 17 April at 12:53 UT, a 22.4 second LMDPS burn put the flight path entry angle at -6.49 degrees. 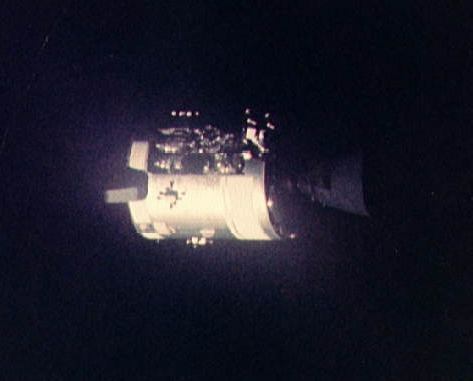 The Service Module, which had been kept attached to the Command Module to protect the heat shield, was jettisoned on 17 April at 13:15:06 UT, and the crew took photographs of the damage. The Command Module was powered up, and the Lunar Module was jettisoned at 16:43:02 UT. Any parts of the Lunar Module which survived atmospheric re-entry, including the SNAP-27 generator, planned to power the ALSEP apparatus on the Lunar surface and containing 3.9 kg of plutonium, fell into the Pacific Ocean northeast of New Zealand. Apollo 13 splashed down in the Pacific Ocean on 17 April 1970 at 18:07:41 UT (1:07:41 p.m. EST) after a mission elapsed time of 142 hours, 54 minutes, 41 seconds. The splashdown point was 21 deg 38 min S, 165 deg 22 min W, southeast of American Samoa and 6.5 km (4 miles) from the recovery ship USS Iwo Jima. On 13 June 1970, the Apollo 13 Accident Review Board published the results of its investigation. The explosion was found to have been caused by a bare-wire heating element within the fuel cell liquid oxygen tank. The element itself had burned off its insulation through a combination of unimplemented specification changes early in the program, coupled with unauthorized procedures during ground testing. The Apollo 13 Command Module "Odyssey" is now on display at the Kansas Cosmosphere and Space Center, Hutchinson, Kansas. NASA's Apollo 13 Service Module oxygen tank number 2 exploded ("Houston, we've got a problem"), damaging oxygen tank number 1 and the interior of the Service Module. With the oxygen stores depleted, the mission had to be aborted. H. Debehogne discovered asteroid #2364 Seillier. E. Bowell discovered asteroids #2759 Idomeneus and #2830 Greenwich. The first flight of NASA's Space Shuttle program ended when Columbia landed at Edwards Air Force Base after a successful two day mission. Originally scheduled for launch 10 April 1981, STS 1 was postponed due to a timing skew in the orbiter's general purpose computer system where backup flight software failed to synchronize with the primary avionics software system. STS 1 was then launched 12 April 1981 after a countdown that proceeded on schedule. Major systems were tested successfully on the first flight of the Space Transportation System (STS, the official name for the Shuttle program). The orbiter sustained tile damage on launch and from the overpressure wave created by the solid rocket boosters. Subsequent modifications to the water sound suppression system eliminated the problem. Sixteen tiles were lost and 148 damaged. STS 1 ended on 14 April 1981 when Columbia landed on revolution 37 on Runway 23, Edwards Air Force Base, California. Rollout distance: 8,993 feet. Rollout time: 60 seconds. Launch weight: 219,258 pounds. Orbit altitude: 166 nautical miles. Orbit inclination: 40.3 degrees. Mission duration: two days, six hours, 20 minutes, 53 seconds. Miles Traveled: 1.074 million. The orbiter was returned to Kennedy Space Center on 28 April 1981. The flight crew for STS 1 was: John W. Young, Commander; Robert L. Crippen, Pilot. M. Watt discovered asteroid #2675 Tolkien.